GURPS April 12, 2019: Last Call! Munchkin Mini-Expansions Kickstarter Ending Today! [GURPS] April 12, 2019: Last Call! Munchkin Mini-Expansions Kickstarter Ending Today! Thread: April 12, 2019: Last Call! Munchkin Mini-Expansions Kickstarter Ending Today! April 12, 2019: Last Call! Munchkin Mini-Expansions Kickstarter Ending Today! This is your last chance to join the Kickstarter campaign to create new Munchkin Cthulhu, Munchkin Zombies, and Star Munchkin mini-expansions. We're happy to report that backer support has unlocked all the stretch goals: all three mini-expansions each have 30 cards! Your support has made these new cards a reality &ndash; join in now before it's too late! Bonus! 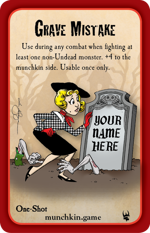 Backers at the $21 reward level and higher will receive a pack of 12*Munchkin promo cards (a mix of older cards as well as completely new cards). Check out the project before it comes to an end later today.